Though American Society of Pain Educators Board President Mary Lynn McPherson, PharmD, BCPS, CPE, FASPE, pointed out “people who do brain surgery every day look like deer in the headlights with opioid conversion … when they can ask any third grader how to do it,” her case studies featuring patients with a lack of therapeutic response and numerous adverse events and medical conditions, as well as formulations with different dose infusion rates, required skills in opioid conversion calculation above elementary school level. 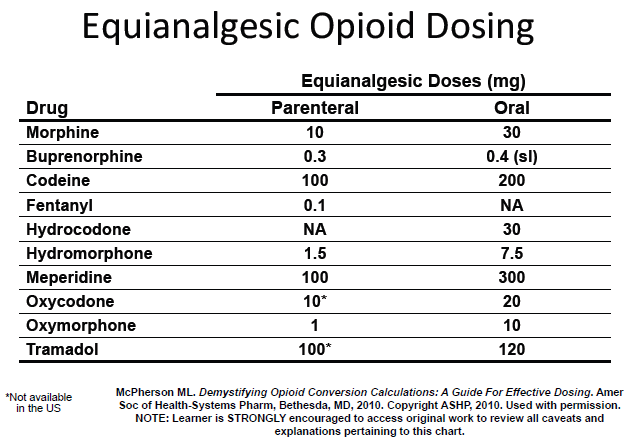 After distributing copies of an equianalgesic opioid dosing chart published in her 2008 medical book, Demystifying Opioid Conversion Calculations: A Guide for Effective Dosing, at the start of her PAINWeek 2013 session on opioid conversions, McPherson explained that although the proportion of 30 mg of oral morphine equaling 10 mg of parenteral morphine seems straightforward, the problems with those conversion equations are that they’re accompanied by a mass of footnotes and they don’t take patient characteristics into account — which is why healthcare professionals need to complete the “five-step opioid conversion chart process” before, during, and after the switch to another analgesic. Globally assessing the patient’s pain complaint. Determining the total daily dose of current long-acting and short-acting opioids. Deciding which opioid analgesic will be used as the new agent, and then referring to established conversion tables to determine the new dose. Individualizing the dose based on patient assessment information gathered in the first step. Armed with the chart, the footnotes, and the steps, those in the audience were taken through a problem set of 12 case studies requiring conversions from one oral dosage formulation to another oral dosage formulation; from one route of administration to another route; from one opioid to a different opioid, regardless of opioid formulation; and to and from transdermal opioids.